The booklet was developed by the European Workers’ Participation Competence Centre (EWPCC). It is the first of a series of practical and helpfully illustrated manuals for workers’ representatives in transnational information and consultation bodies. The first manual offers some practical tips on how to make meetings European bodies (auch as EWC or SE works councils) more useful, more efficient and more successful. The manual is currently available in eight languages and can be downloaded as pdf (EN, FR, SW, ES, NL, DE, PL, GR). Since 1994, employees of multinational companies have been entitled to information and consultation at European level. In 2001 an extra dimension was added with participation rights in companies that have adopted the European Company statute (SE). Today, about 20,000 employee representatives are members of a European Works Council or an SE Representative Body, participating in at least one meeting per year where they should receive information about all questions that concern the group as a whole or at least two subsidiaries in different Member States. They must be consulted at a time, in a manner and with a content that allows them to undertake an in- depth study and express an opinion that may be taken into account in the decision-making process. These workers’ rights are now firmly established in different European directives and their transposition into national law. Millions of euros and tens of thousands of working days are invested in the organisation of regular meetings and yet a big majority is rather unsatisfied with the outcome of all these efforts. Nor are complaints heard on the employee side alone, for they are usually shared by management. 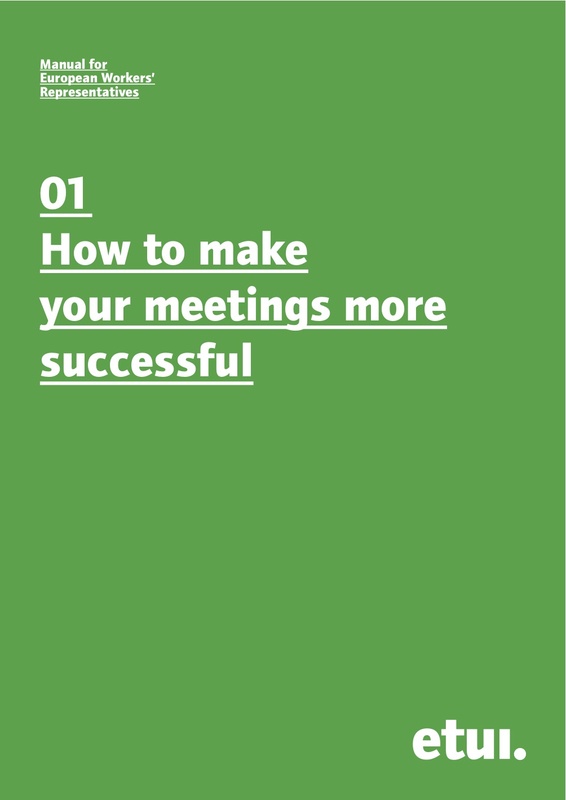 This booklet aims to respond to these concerns by offering some practical tips on how to make your European meetings more useful, more efficient and more successful.